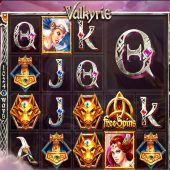 Valkyrie slot from Elk Studios is a great looking addition to the Hall of Gods, or should I say the hall of Norse Mythology themed games. You have some pretty good graphics and animations here, far more detailed than older ones such as Microgaming's Thunderstruck 2 - this slot rivals Play'n Go's classic Viking Runecraft in appearance. Valkyrie, as you may have guessed, is far more feminine for a change and focuses on the female goddesses and warriors and they certainly look very imposing! I hope they don't do battle with our bankroll, as if so it can only end badly. On some spins the reels will darken and 3 bright white bonus symbols will rain down. This means a respin with one of three Valkyrie bonuses guaranteed. Arrow of Fortune - she fires 1 or more arrows onto the grid and each one will produce a block symbol as described above, of the same icon. The reels then stop with hopefully more of the same lining up for a decent win. Shield of Chance - Shields rain down on the reels and any remaining turn into Wild tiles. Sword of Destiny - fiery Swords appear over the 3 spinning reels in the centre and any landing will result in that reel turning Wild. You can only get 3 scatters on reels 2,3 and 4 and may then ask why I said above there are scatters on all 5 reels! This is because when you get 3 Freya may appear to add another to either reel 1 or 5 or both. This can be important as with just 3 as the trigger you simply get 5 spins with one guaranteed to have a Valkyrie feature. Then 4 will award 7 spins with 2 guaranteed features and all 5 is 10 spins with 3 features guaranteed. You can retrigger this very spectacular free games round too. 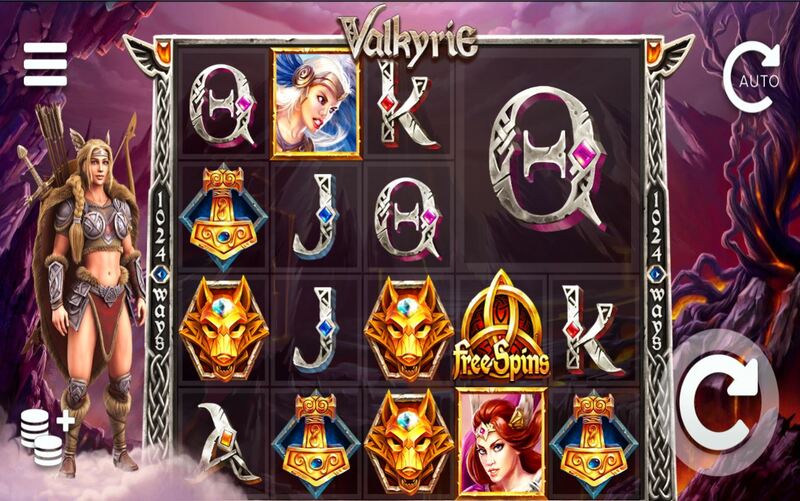 There are few developers who make graphics and animations like Elk Studios and Valkyrie slot is a prime example. Sure enough with 1024-ways you'll see quite a few micro-wins during your play but the random Valkyrie features will negate the effect of those. You also have some big-win potential as Elk Studios claim you can win up to 500k and as the maximum bet is 100 then that means 5000x bet is possible. Free spins are good and usually productive and we get a decent 96.30% RTP as is usual with most Elk games.